These markers are a great starting point for budding artists. A quality set of pens at an amazing price that provides the perfect jumping on point for beginners. The alcohol-based colour-marker market is huge. With 12-marker sets from brands such as Copic coming in at more than £100, there’s an obvious need for cheaper alternatives. 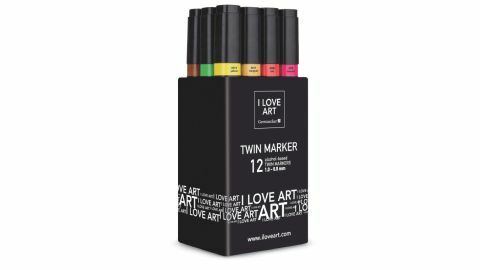 And, right on cue, GreatArt has waded into the fight with its ‘I Love Art’ Twin Markers, which are available in three different sets. You’ll find a 2-6mm chisel tip at one end of the pen and a 1mm fine-detail tip at the opposite end. The pens are nice and chunky, and hold a good reservoir of colour in their square barrel. They also come neatly packaged in a desk tidy. However, the proof of a pen is in its mark-making, and, although the colour seems to saturate the paper to begin with, the colour evens out as it dries. Once dry, you can lay good solid colour over the top, and blending pens are also available. This is a great starter set for the money. This article was originally published in Paint & Draw magazine issue 4. Buy it here.